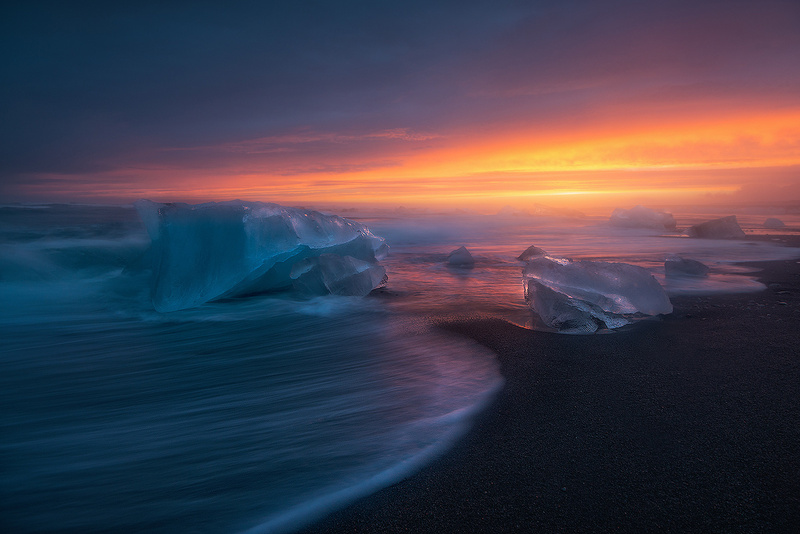 Beautiful ice blocks, like diamonds, in the sun sparkle on the black beach Breiðamerkursandur and transform it into a glowing field of ice. The whole beach is covered with chunks of ice which brings up a really mysterious atmosphere. Love the hazy look. Adds something unique to the location. Thank you so much, Ryan! You are right, this location is quite popular but this sunset made it very unique. Cheers! Very beautiful. My eyes cannot stop moving. Wow! Very nice image. Is that some serious Orton Effect, or actual sea mist causing that glow?